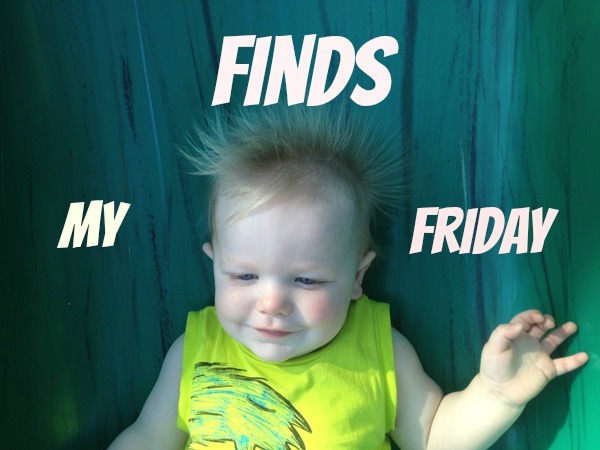 My Finds Friday - Vacation - Baby Doodah! Happy My Finds Friday, vacation edition! What a lovely, lovely mini-vacation it has been, I have gotten so much accomplished, including plenty of relaxation. Wednesday I spent the morning getting into a new series, Scandal, it is soooo good, I wrote a couple of blogs posts and then I went on a nice long and luxurious bike ride around Buffalo. I do enjoy taking Emmett with me in his trailer, but sometimes it’s nice to get out their on my own. I came home, made myself a nice lunch and relaxed some more. Thursday, after taking Emmett to take day care I came home and cleaned. Cleaning is totally NOT relaxing or fun, but it needed to be done and having things clean makes me feel so much more relaxed overall. So it’s win-win! I had made plans with my sister Bridget to meet in-between her college classes and I completely forgot, I had gotten so absorbed in my cleaning that I let our lunch date slip on by. Thankfully she has a nice long break between classes so I was able to shower and get out to Panera, before she had to go back to campus. It was really nice to get to sit and chat with her, it had been so long since we had an opportunity to do that without any interruptions. Seamus was picking up Emmett, so when I got home I went out on another bike ride. It has been such a beautiful 3 days, I’ve gotten out and made sure to soak every bit of it. And today, today has been wonderful! Seamus took the day off and we’ve spent some time just being a couple. We went for a leisurely breakfast and then ran a few errands, we relaxed watching some TV and talking. It was lovely! Seamus went to workout and I blogged, I’ve been blogging like crazy since I’ve been off. It has been heaven! Tonight we’re meeting my parents and siblings for dinner at Danny’s, I can’t wait to see everyone. I hope to one day go on vacation with Emmett and even though we don’t currently have plans for traveling, I like to google and see what I can find as far as great family friendly vacation spots. This article on Parents.com shares the top 10 family friendly resorts, there are some really great options. The thought of flying with Emmett makes me a little squirrely. I have no idea what to expect or how to even handle the situation if it should come up, Jaunted has a great article with some fantastic tips on how to fly with a baby or toddler. I will be bookmarking this one! And here’s a little shameless plug for myself – Kendra Thorton wrote a guest post with some tips on traveling with a loving family. Have you made the most of Pinterest when it comes to pinning your pins? If not, check out Reviewz ‘n’ Tips article on ways to increase your repins. Fall is coming (or is it here?)! Either way, it is apple season and what better food to make with apples than apple sauce? Emily Bites has a lightened up Slow Cooker Applesauce recipe, and it seriously looks DEEEE-licious! Be sure to stop on over and give all of these finds some love! What vacation finds do you have? Share away by linking up below!